Four riders qualified for this horse show by accumulating points in their respective division over the course of the regular season. Truman’s team qualified to compete in the zone finals which took place April 7. Hannah Patton and Renata Thoeny placed in the top two of their classes and qualified to complete as individuals in the zone finals. During zone finals competition, one rider from each of the five schools being represented competed in their respective division and earned points toward the team total. 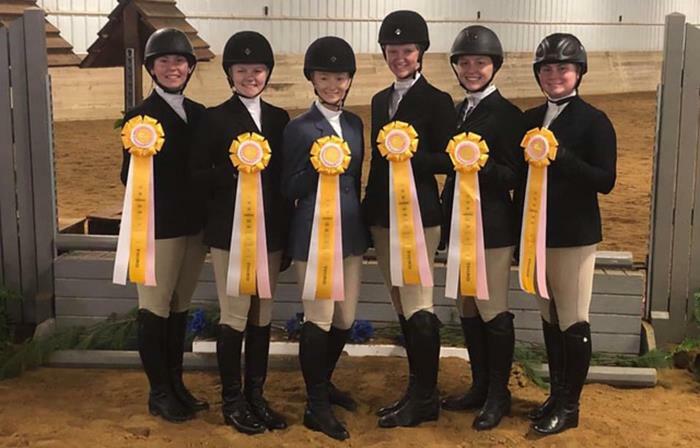 Truman was represented by Elizabeth Maune (walk/trot), Marissa Dull (walk/trot/canter), Emily Brightbill (novice flat), Kaitlyn Nance (novice fences), Thoeny (intermediate flat and fences) and Patton (open flat and fence). Overall the team finished in third place in the zone finals. Patton placed third and fourth in her classes and Thoeny placed ninth. In order to qualify for nationals, individuals or teams have to place first or second.